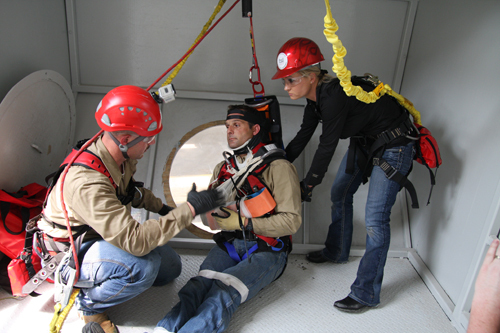 Elevated Emergency Management provides the knowledge and skills needed to perform basic first aid, victim stabilization, packaging and evacuation from remote, elevated work locations specific to the wind turbine industry. 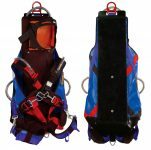 Tech Safety Lines’ rescue training program meets or exceeds ANSI and OSHA standards for safety. The primary purpose of the course is to have EEM trained personnel on scene to understand the importance of patient assessment and rapid care when dealing with life-threatening injuries. Members trained in EEM will be able to provide a level of victim stabilization, wound protection, and quality of care that typical rescue providers do not offer. This ability takes advantage of the pre-hospital time period, thus maximizing patient survivability. Students will be instructed in first aid response, basic life support, victim and incident control, injury management, and patient evacuation in situations where professional medical assistance is impractical or untimely. TSL proudly utilizes members of Dallas Fire Department’s Tactical Rescue Team as instructors for the EEM course. These trainers are also part of a statewide Urban Search & Rescue team, Texas Task Force I and II. TSL provides CPR training through the American Heart Association. Students are certified in First Aid, CPR, and Automated External Defibrillator.